"I don't like fish, but I LOVE this soup!" Melt butter in a large pot over medium heat. Saute onion, celery, and garlic powder until onions are tender. Stir in potatoes, carrots, broth, salt, pepper, and dill. Bring to a boil, and reduce heat. Cover, and simmer 20 minutes. Stir in salmon, evaporated milk, corn, and cheese. Cook until heated through. The recipe, as listed, is more like cheese soup with salmon in it. 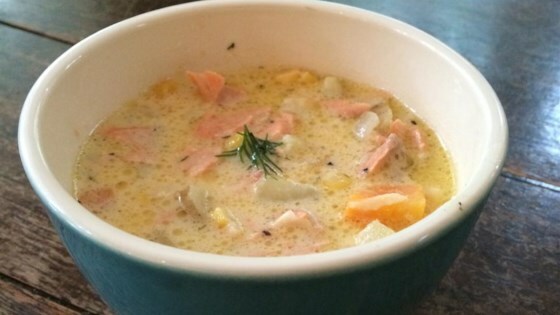 Leave out the cheese, and you actually have a lovely salmon chowder. We prefer this without the cheese.